The publication of the Rethinking Hell book represented the fulfillment of an idea that I had come up with a number of years before; namely, to compile various articles and chapters by evangelical Christian thinkers who held to the view of conditional immortality into one collection (we did deign to allow the Orthodox Christian philosopher Richard Swinburne to slip in among all those evangelicals as well). 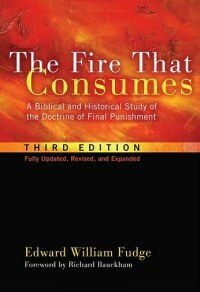 While we knew Edward Fudge’s magnum opus on the topic, The Fire that Consumes, certainly could not be bested in terms of the exegetical and theological work he had done to support the conditionalist view, it did seem like it would be helpful to expand the public awareness of many other Christian scholars, pastors, and leaders who had also cogently argued for this understanding of God’s final judgment alongside of the celebrated Mr. Fudge. For a while, I had been making photocopies of various articles and book chapters by these conditionalist authors to send to those who were interested in finding out more about our view, so my thought was that if we could simply gather all of these excerpts into a single book, a “reader” on the topic of conditionalism/annihilationism, it would save ME quite a bit of work at the copier and would be a great resource to stand alongside Edward’s book. (This desire to complement The Fire that Consumes was, of course, the reason why we came up with a very similar cover design to the third edition of Edward’s book.) I shared the idea of this reader with my good friend, fellow theology student at Fuller Seminary, and co-steward at Rethinking Hell, Joshua Anderson, and we began to compile all the conditionalist articles that we would thought would be the most helpful for those who wanted to think through our view. Being a philosopher, Josh was able to dig up a number of essays I had not come across before. However, coming up with an idea for a book would only go so far…it required a person with the initiative and tenacity to actually move this project forward. Luckily, we had a friend and colleague within the Rethinking Hell project who fit this bill: the inimitable and unstoppable Chris Date. Chris was the one who truly pushed this idea into reality through finding a publisher, putting forward the proposal, and leading out on the process of seeking out permissions, digitizing and editing the material, and organizing the complexity of a full book manuscript. We commissioned the founder of the Rethinking Hell project (though he resists this title), Peter Grice, to write an introduction that would give some context to the reader about the larger scope of our whole project, which he did a wonderful job articulating, and we asked our friend and one of the leading contemporary advocates for conditionalism, Glenn Peoples, to provide a summary chapter defining “evangelical conditionalism,” which we feel shares many of the conservative and traditional values of evangelical theology, while breaking away from the traditional evangelical doctrine of eternal torment. The beginning of the collection was coming together very nicely–however, not all of our ideas ended up being included in the book. For some of the works, we had difficulty finding out the proper entity from whom we could obtain permissions. 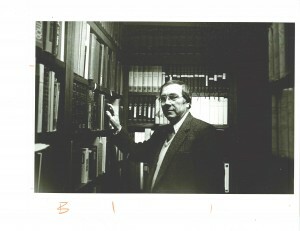 For instance, New Testament scholar E. Earle Ellis had passed away a bachelor, with no clear family member as inheritor, so we had an extraordinarily difficult time finding out who actually owned the reprint permission rights for his chapter “New Testament Teaching on Hell” from the edited volume, Eschatology in Bible and Theology. In the end, it turned out our own publisher, Wipf & Stock, owned the rights for American reprints of the piece, but we couldn’t find out who owned the international rights. Emails to various publishers and scholars in the UK finally yielded a response from the eminent NT scholar, I. Howard Marshall, who pointed us to folks at the International Reference Library for Biblical Research, which was an organization Ellis had founded and who held the international rights. We contacted the president of the IRLBR, Randy Richards, with our request and he bought the request to the board, who voted to generously allow us to use this article free of charge, which was a tremendous blessing to us and a reflection of their desire to simply see Ellis’ work continue to serve the Christian community. There were also a number of other authors and publishers who granted permission for us to use their work for free, which we gratefully noted in our Acknowledgments section of the Rethinking Hell book. We were thrilled when Regent College Professor of Theology & Culture John Stackhouse agreed to write the foreword to this collection. I had been a reader of Stackhouse’s many significant Christian works for years and had discovered that he held to the conditionalist view when I downloaded a lecture on hell that he had given. He was one of the first guests that Chris had interviewed on the Rethinking Hell podcast, so it seemed wonderfully providential to us that he would introduce our book (as well as later serving as one of the plenary speakers at our inaugural conference that summer). The endorsements that were given for our book blew our minds, starting with our theological hero and inspiration Edward Fudge, whose praise would have been sufficient in and of itself. However, we also received endorsements from scholars coming from various disciplines, including Northern Baptist Theological Seminary professor of Old Testament, Claude Mariottini; the venerable New Testament scholar I. Howard Marshall; systematic theologian Terrance Tiessen; and philosopher James Spiegel (whom I was privileged to get to know well in the fall of 2014 when we were both part of Biola University’s Center for Christian Thought–Jim is truly an amazing resource to both Christian scholarship and the church, and we are delighted to feature him as a plenary speaker at this summer’s 2nd Rethinking Hell conference at Fuller Seminary). After the release of the book, we did not experience the massive popular reaction to the book that we might have dreamed of, including but not limited to a wide-ranging evangelical paradigm shift toward conditionalism, a cover article from Christianity Today (we are still available whenever they are ready), or even a modest book review in Relevant magazine’s online edition. Heck, we would have even take a tweet from John Piper saying, “Farewell, Rethinking Hell”! However, we were gratified by a few responses from various evangelical thinkers that came out over the months after the book was published. NT scholar and popular Christian author Scot McKnight did a series of 13 blog posts on his Jesus Creed site on Rethinking Hell, calling our book an “exceptionally useful anthology of scholarly pieces” and he made our year by listing our reader as one of the best theological books of 2014. Recognition from a scholar of McKnight’s reputation was such an incredible compliment and certainly opened up our work to a much wider audience in his thoughtful readership. However, McKnight himself did not come over to share our conviction. But he did point out on his blog someone else who did come to hold our view! Systematic theologian Terrance Tiessen, who had previously defended the traditional view in his entry on hell in The Global Dictionary of Theology, recommended our book, which he called a “wonderful collection,” in a lengthy blog post where he commented on each chapter. He also provided a wonderful endorsement on the back cover of the book itself. 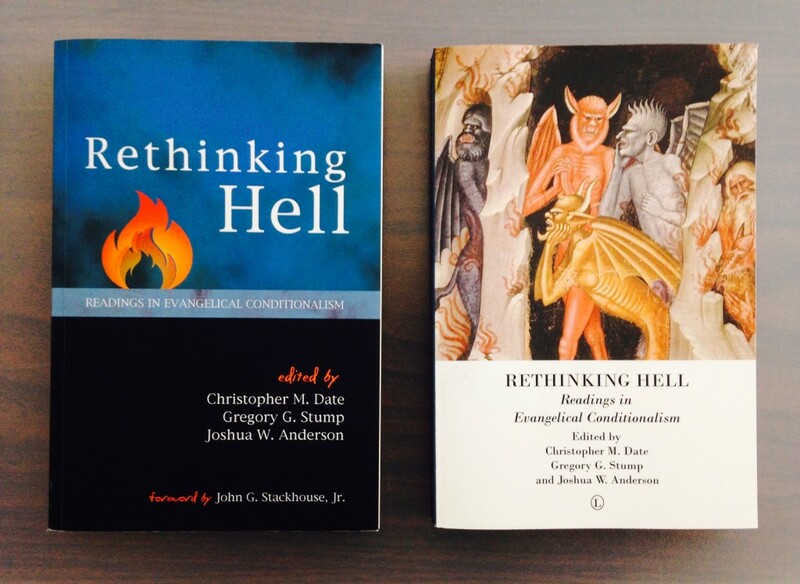 Although Tiessen had been considering the evidence for conditionalism for many years, it seemed that our book and the resources of the Rethinking Hell project had been an important part of his eventual embrace of conditional immortality/annihilationism. It is incredible to think that this humble project has been able to have an impact on such a significant evangelical thinker! We were also grateful for commendations from Christian thinkers such as Frank Viola, who wrote that our book “argues with sophistication the ‘conditional’ view of hell,” and “Formerly Fundie” blogger and author Benjamin Corey, whom I had the chance to meet this year when he was in town as part of his D.Miss. program at Fuller Seminary. 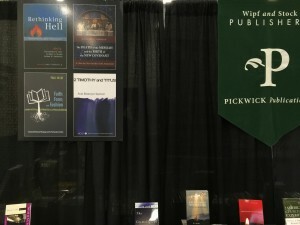 We are also deeply thankful for the team at Cascade Books/Wipf & Stock for their work in promoting the book, including featuring us at their booth at the November 2014 Conference of the Evangelical Theological Society in San Diego. While endorsements and commendations are profound blessings, our primary hope for the Rethinking Hell book is that it would be a helpful resource for Christians who are willing to engage what we believe is a deeply compelling, scripturally faithful, and theologically sound understanding of God’s final judgment. We realize that the book is an expensive investment–listed at $40 on Amazon–so we’d like to offer a special anniversary sale of the book for $20, which is our cost as the editors, and we are able to pay for shipping to the United States or Canada, thanks to the generous support of a donor who desires to get this work into as many hands as possible. If you’d like to take advantage of this special offer, please email me at gregstump@rethinkinghell.com and I will work to get our book to you as soon as possible! We may need to limit the amount of books we can sell and ship, but please get in touch with me–we would love to get you a copy! I’m also happy to offer a short teaser that we will have a SECOND book available from Rethinking Hell this year! This volume will be a festschrift, which is a collection of essays in tribute to an influential scholar, that will be called A Consuming Passion: Essays in Honor of Edward Fudge, edited by Ron Highfield and Chris Date. The 20 plus chapters in this book consist of many of the papers that were delivered at last summer’s inaugural Rethinking Hell conference, along with other essays submitted by Edward’s admirers and those who have been influenced by his work. Look for more information on this forthcoming book to come out soon! *On November 27, 2014, a UK edition of the Rethinking Hell book was released by Lutterworth Press with a variant cover design. The devils depicted on the cover were certainly not the illustration that we would have chosen, but we actually didn’t even find out that this version had been released until our intrepid team member Joey Dear happened to come across it on an Amazon search for books on hell!